Jesus lived in Palestine 2000 years ago but his life and teachings continue to have a lasting influence on the World today. 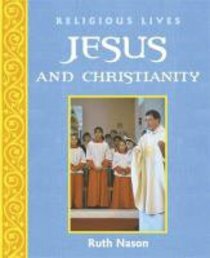 This book describes the life and death of Jesus and explains his most important teachings. It examines the sacred texts of the Bible, in particular the New Testament which is focussed on Jesus, and how they came to be written. And it explores the major sacred places and festivals associated with the life of Jesus. This differentiated (simplified) text edition of GREAT RELIGIOUS LEADERS: JESUS AND CHRISTIANITY considers how the life and teaching of Jesus affect people today, thus making it a great introduction to this important world religion. - Publisher One of a series of titles looking at the lives, teachings and influence of the founding figures of the world's major religious traditions. One of a series of titles looking at the lives, teachings and influence of the founding figures of the world's major religious traditions.